"Beyond The Sea features Coreen Scott, usually associated with Scottish songs and in particular works by Robert Burns. Here, the East Lothian/Edinburgh-based artist takes herself and her listeners off to other lands...An eclectic collection, all faultlessly delivered with clarity and warmth..."
Hard copies are available to purchase from the Birnan CD online shop and Amazon UK or download online through iTunes now. Edinburgh and East Lothian based singer Coreen Scott has a fresh twist to her repertoire for her new CD, Beyond the Sea. Normally associated with her Scots singing and interpretation of Burns, Coreen has looked across the seas for inspiration, singing songs in French, English and Portuguese. From the haunting melodies of Who Knows Where The Time Goes and The Briar and The Rose to the thought-provoking lyrics of Weeping and the deceptively jaunty sound of Je ne veux pas travailler, Coreen’s voice soars above the beautiful instrumental melodies and tight-knit harmonies;; there is something for everyone on the CD. Fans will find much appeal in Coreen’s lovely interpretations of such classics as Dylan’s To Make You Feel My Love, Piaf’s La vie en rose, and Christine McVie of Fleetwood Mac’s Songbird, but also new rhythms in the South African Weeping, the Portuguese Manha de carnival and the lovely French La Mer. Coreen is joined on her CD by a huge cast of musicians including guitarist Jonny Gibb, double bass player Carole Melrose, guitarist and singer Alasdair Morrison. Vocal harmonies are provided by Jenny Swan and Christine Charles, who both sing with Opera East Lothian. Aislinn Fauklner plays harp, Laure Paterson violin, Gary Gilbert guitar and Bill Crook mouth organ. The album also features jazz guitarist Marcus Ford who accompanies Coreen on her favourite Piaf song La Vie En Rose. The album was recorded and engineered by Ian McCalman. The CD is available to download online through iTunes and hard copies are available to purchase from the Birnam CD online shop and Amazon UK. 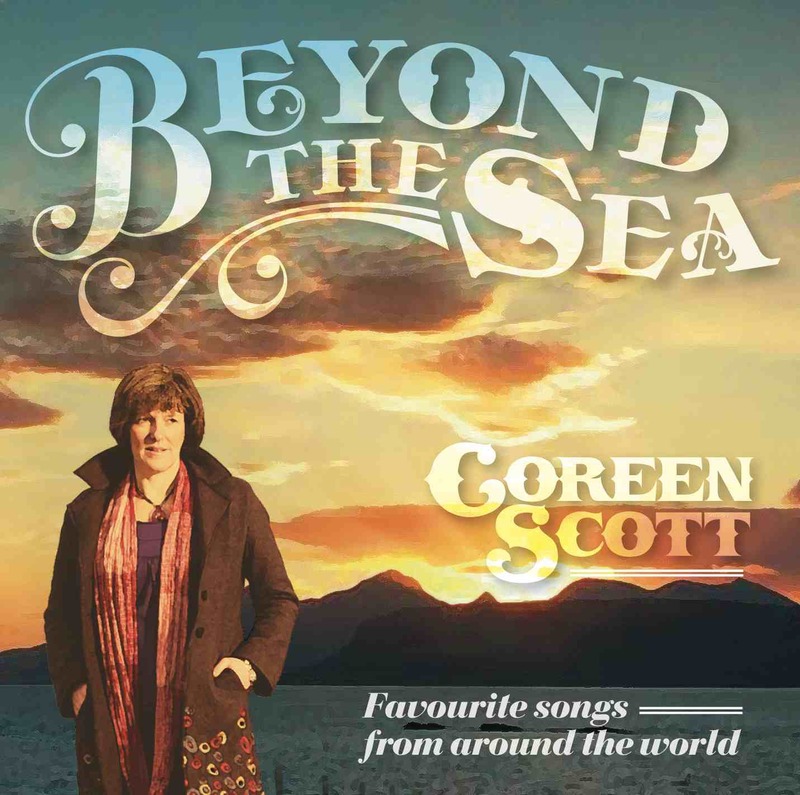 “Beyond the Sea is an album of songs from Scottish wedding singer Coreen Scott. On this her second album release she is joined by a large cast of supporting musicians. The songs are interpretations and covers of popular music in a mix of languages, namely English, French and Portuguese, and some folk numbers. The material covers a broad and eclectic range but as a result lacks perhaps a little cohesion as an album, being more a collection of good but separate songs. La Mer is a beautifully breezy version, transporting the listener to a stylish French seaside getaway. Several more French songs are featured, while Portuguese songs such as Manha de Carnival are more emotional and again evocative. The British folk tradition is visited in Briar and the Rose with more contemporary material in Bob Dylan’s To Make you Feel My Love and Songbird from Christine McVie, the latter being particularly well sung here. Throughout, the tone is light and positive, often bringing a smile to the listener’s face. “Best recognised for her traditional Scottish songs, Coreen Scott has taken a turn, quite literally in another direction. Scott has travelled to France, England and Portugal to draw inspiration to create this wonderful album. Listening to this album, I am taken on a journey with Coreen Scott, I particularly enjoy her interpretations of “To make you feel my love” which until this album I thought that it was originally by Adele. No, Scott’s version of Bob Dylans beautifully written song suits Scotts voice and I am glad its makes a appearance on her album. If I am honest, I had never heard of Coreen Scott before. However after listening to this album I am sure to be listening to her previous records. I was also pleased to hear that Songbird by Fleetwood Mac was on this album. No matter what song she is covering on this album. Scott manages to take all of these songs and take stamp her own style on them. Here is where we notice the influences of other counties, such as Manha De Carnival a Portuguese song. Tracks such as these are a nice break from the rest of the songs, it’s a nice change.